TOKYO (TR) – Tokyo Metropolitan Police are seeking the help of the public in locating a former organized crime member suspected in the robbery of an internet cafe in Bunkyo Ward earlier this week that left one employee seriously injured, reports the Sankei Shimbun (Nov. 24). Police are seeking the whereabouts of Naoki Hatano, 41, in the stabbing of the employee at the cafe, located in the Yushima area, at around 7:30 p.m. on Tuesday. The employee suffered wounds to the shoulder and buttocks. The perpetrator fled the scene after taking 300,000 yen in cash from a safe. The victim was transported to a hospital with injuries considered serious. 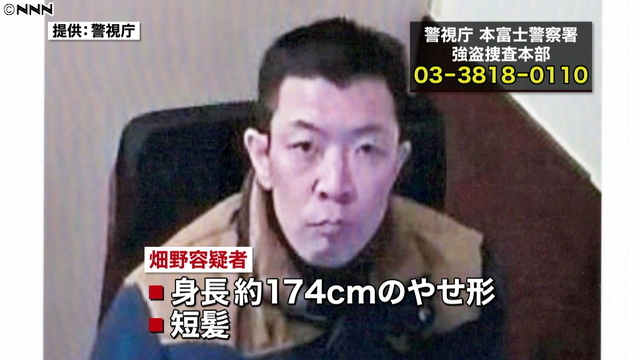 In a photograph released by police, Hatano is shown with closely cropped hair. Standing 174 centimeters tall, he is of medium build. He has an irezumi tattoo of a samurai warrior on his back. According to police, Hatano was a customer in the cafe for a two-hour period prior to the attack, which took place once no other persons were inside. Persons with information on the case are advised to call the Motofuji Police Station at 03-3818-0110.